Personalized Softball Gifts! All the bases have been run, the innings played, and Home Plate is in sight! Time to Celebrate! Hit it out of the park one last time with some great Softball gifts and party decorations that will start the celebration! 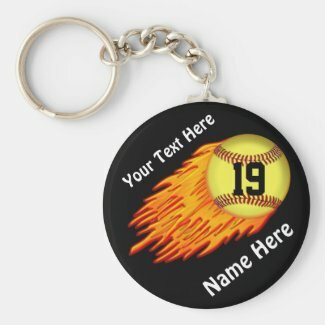 For a complete list of Girls Softball gifts and favors, visit our Zazzle store, known for its state of the art printing, 100% satisfaction, and no minimum order! Contact Bev at 239-949-9090, and be sure to Visit our Store! This will Greet the Team! Customize this 36×12 Softball Team Poster at no extra charge, to Greet the Softball Team Players with a Message of Congratulations! Their Name and Number, School Name, any Text of your choice! Changing the background colors to team or school Colors is an option! Click on the poster for customizing your special message for Senior Softball Night! What makes us different? Our unique gifts and keepsakes are meant to be customized at no extra charge ~ Ever! We add an extra “high five” with your player’s Name and Number or School Name and Year, even Pictures! Some backgrounds can be changed to team or school colors! Customize and Celebrate! Your softball player will love these unique keepsakes! Softball Party Decorations Idea! Baseball stitching done by little fingers ~ boy is this cute or what!! With the help of some little ones and Pitter Patter Art you can create some really cool decorations for your Softball Senior Night! Thank you, Pitter Patter Art! Another great idea for Senior Softball Night ~ Put softballs or bats in a large sturdy vase…now that’s just a good game plan! Many thanks to The Obsessive Crafter for this terrific idea for decorating for Senior Softball Night! 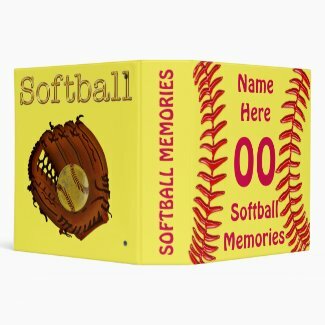 Goodie Boxes, Wrapping Paper, Ribbon, and Stickers ~ Great Senior Night Softball Ideas! Customize and personalize this spiffy Softball Goodies Bag or Favor Box for your Softball Senior Night! You can choose your text for School or Team Name and Year, even the color of the ribbon and five different style boxes. These will look cool in your line up for Softball Senior Night! Should you need help with the text boxes, please call Bev to help you, 239-949-9090. For some cool Baseball Cookies, check out Beki Cook’s Cake Blog! Yumm! Another idea is to use AndreaMosaic Artwork to create a neat mosaic out of pictures taken during the year ~ an idea that looks terrific and would be quite a keepsake! Along these lines you can do a slide show for pictures taken during the year. You can even have music integrated into the slideshow. You should give it a try! Check out this tutorial at Hub Pages, How to Create a Movie in Picasa. This is a very easy and zero cost except for asking for picts throughout the year. You can download it to YouTube and set the viewership to private or public as you desire. Playing this will be a home run! Sweet! This wrapping paper comes in lengths up to 60 feet! Just imagine the decorating and/or wrapping you could do! You could wrap up the whole baseball diamond, practically! Just kidding! But seriously, this wrapping paper has Senior Night Softball Ideas written all over it! Customize with the Team Name or School name for a great decorating scheme for your Softball party! Wrap the table, use a little here, a little there ~ just a few more great Softball Senior Night ideas!! Of course, if you would like a slightly smaller amount, the wrapping paper comes in five different lengths, with 6 feet being the shortest. Great wrapping paper for Coach’s gift! Softball Party Decorations ~ Creativity abounds for Softball Senior Night Ideas! With this grosgrain ribbon, which comes in 2 yards, 6 yards, or 10 yards, you can decorate the party table, create favors, or wrap a special gift! Text can be changed to Monogram, Jersey Number or Year with a combination of these. Changing the first text box to a four-digit year is pretty cool ~ just be sure to adjust the font size to accommodate the size ~ 12 to 16 works nicely. Experiment and keep in mind how the customizing will look when used. Of course, please call Bev at 239-949-9090 if you need any help. 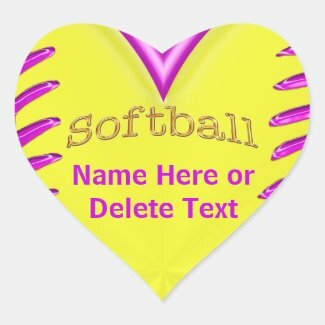 CUTE stickers for party favors or to complement your softball party decorations. Personalize with Name or Team or School name and Year or other text. Great for filling in with other Softball Senior Night Ideas. Of course there is no minimum order, but you can order more than one sheet and receive bulk discount, with each sheet of 20 customized differently. Just be sure to “Add to Cart” after customizing each sheet; that way. you will receive incremental bulk discounts when ordering. Any questions, please call Bev and ask for any assistance 239-949-9090. PARTY IDEA! Fill the bottom of a square clear thick glass container with peanuts, either shelled or not (watch for allergies), top with AstroTurf cut to fit, top with a pyramid of softballs, wrap a ribbon around and place a sticker, and voila! you have a great centerpiece! This great idea comes Thanks again to The Obsessive Crafter! Softball Senior Night Ideas that will really bring the chatter! 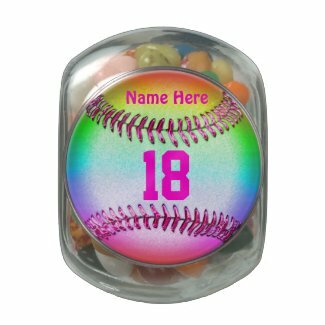 This cute and cool multi-colored softball decal can be moved 100 times! So why not let it shine as part of the decorations for the party?! You can put your text, saying words of “Congratulations!” or the team name and year or whatever you would like! And when the party is over, it can come home and be put up on a wall, continuing the memories and the coolness! Made in the USA. Three sizes, from 12×12 to poster and beyond! Softball Scrapbook is Perfect For Senior Memories! Of course along with the Softball Senior Night Ideas comes the Scrapbook to hold and display all the memories of photos and laughs and memorabilia, newspaper articles and accolades and awards. Yes, the final inning has been run, the last home run scored. There is, indeed, sweet victory for a game well played! Heading off to College with Great Softball Team Memories! 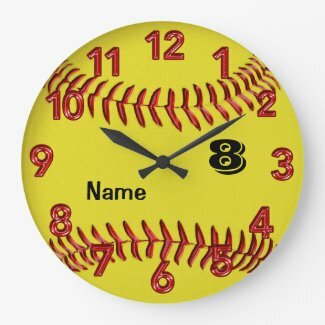 This softball theme clock is another great practical gift that will carry memories along with you after graduation and even for those still in high school, playing hard! Enjoy customizing this with your player’s name and number, knowing the celebration and memories will carried forward, no matter the time zone! Perfect Gift for a Softball Player with Heart! A perfect gift for a softball player with heart! This pretty silver colored metal keychain will show off her Jersey number and keep her memories close to heart! This keychain comes in different shapes. Click on any of the keychains shown here and enter our Zazzle store to shop for other styles and varieties of keychains! A Sweet Candy Jar! A perfect combination, sweet and practical for our Softball Senior Night! A keepsake that will hold anything from A to Z in the upcoming college and graduation days and serve as a sweet reminder of friends and fun times ~ and all the great work! Enjoy the reward! Comes in different sizes, even a Jellybean shaped tin! 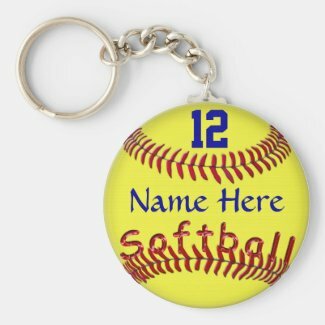 Of course all can be personalized with Name and Jersey Number or School Name and Year or other TEXT of your choice, even Senior Softball Pictures! What a Great Senior Softball Gift! No minimum order! If you have more than one customized order, be sure to “add to cart” after each unique customization. And be sure to check for bulk discount, too. This is a great time to mention with Zazzle Black, shipping is free for all orders! Yes, that’s a Line Drive for pulling off a memorable Senior Softball Night! More Great Gifts for Girl Softball Players! For more great gifts for Girl Softball Players, we would like to introduce you to our Collection of Girls Softball iPhone cases! Find even more treasures in our amazing collection of Customizable Girls Softball Pillows! Beautiful keepsake gifts that are not only great memory makers and keepsakes, but practical as well! Many are made in the USA! Softball Mom, show off your Senior Softball player! Easy to add text of your choice! Let everyone see how proud you are of your player…or the whole team! One of a kind, comfortable 100% preshrunk cotton, six color shirts to choose from ~ a sure classic! Thanks, Coach! These cool mugs will say a very classy “Thanks Coach!” You can even add the Team Photo to the one on the left! Team Players’ Names and Numbers can be added to the mug on the right! Click either mug to link to our store for ordering these classic one of a kind keepsakes! As always, if you need help with adding names or team picture, please call Bev to help you at 239-949-9090! Amanda Scarborough Motivates Girl Softball Players ~ and How! Amanda Scarborough is on another mission, along with all her great accomplishments. She wants girls to Dream Bigger, Work Harder, and Smile more Often. And after reading her motivating blog, that’s exactly what you will aspire to do! Visit Amanda Scarborough’s blog and read her story, and be inspired to go out and Win it on and off the field! Whoop! Amanda’s blog is filled with Inspiration, Motivation, and Information empowering players as well as educating moms and dads how to be on-board for the long-term and short-term benefit of their daughter who loves to play. Videos, how-tos, get-over-its, think-it-throughs, and just plain great “meat” on the bones for girls who want to give it their all for the game. Long-term goals and dreams, present time hard work and practice, covered with consistency and wrapped up in understanding by all involved in the girl’s life, dreams, goals, and proud moments. Be sure to check out Amanda’s blog! Join forces with other players who are improving the game as well as gaining greater confidence and skills and charting a course for lifelong success, dreaming bigger, working harder, and smiling more often! Whoop! 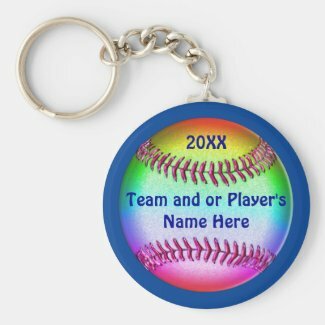 To find more treasures and even more Softball Senior Night Out Ideas and gift ideas for family, friends, sports players and fans, visit our Zazzle store! Zazzle is known for its amazing state of the art printing, and complete customer satisfaction. Should you sign up for Zazzle Black, shipping is always free ~ that is quite a perk! And perhaps best of all, no minimum orders, ever, and no charge for customizing! Visit our store and see if you can find just what you’ve been looking for!